The history of the V&A's Leighton Rooms provides a fascinating glimpse into the architectural changes that the Museum has undergone throughout the years, reflecting shifting ideas about how a museum should present its collections. The gathered experience of past ages is a precious heritage and not an irksome load. Walking through the Leighton Rooms, 102 and 107, visitors encounter two curious, richly decorated rooms dominated by a pair of large semi-circular murals. Plutus, the god of Wealth frolics with Industry's god, Irene, in a grand celebration of Art's noble achievements, while in the corner Blind Fury and Ignorance are restrained from hindering the advance of Progress. But how did this section of the Museum come to be? And what became of the grand glass-and-iron vaulted court that once housed these paintings? The Leighton Rooms were originally a balcony, open on one side. If the partition walls opposite the murals were removed, you would be looking out into a large exhibition gallery, the South Court, built in 1862. At one end of the partition wall in Room 102 is a window which provides a glimpse of the Court's cast iron and glass roof, and fragments of its rich decoration. During the mid-19th century, the Museum's rapidly expanding collection of metalwork, furniture, textiles, and all other forms of decorative art necessitated its move to larger premises. 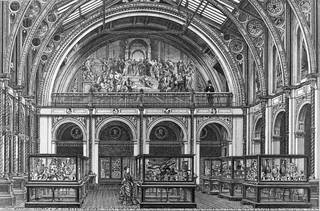 The 'South Kensington Museum' (as the V&A was then known) transferred to its present site in 1857. The South Court, a vast two-storey glass roofed gallery, which was considered the centrepiece of the Museum, was completed in 1862 by architect Francis Fowke, a captain in the Royal Engineers and the inventor of, among other things, the camera bellows and a portable bath. Fowke's South Court comprises two long double-height rectangular galleries running north to south, each supporting a spectacular glass roof with semi-circular iron ribs. These two halls are linked by a two-storey arcaded corridor. The Museum chose ornamentation that fitted the dignified surroundings – the South Court was decorated in an elaborate combination of cast iron, mosaic, stencilling, painted panels and frescos. Over the subsequent years, 35 mosaic panels, presenting full-length, life-size portraits of painters, sculptors, architects and craftsmen, were placed in the arcade niches around the upper level of the South Court. 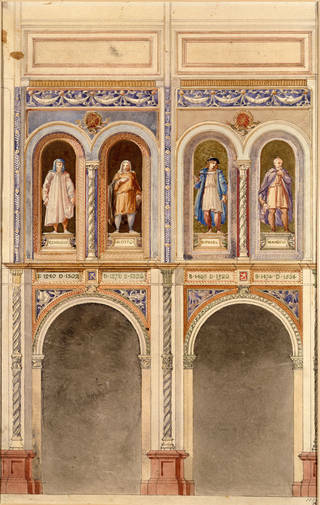 Ranging from Renaissance masters, such as Leonardo da Vinci, to lesser-known figures from the applied arts, such as the potter Bernard Palissy, the portraits were meant not only to reflect the established canon of great artists but also, by including craftsmen, to expand this canon to include the decorative arts. This elevation of architecture and design to the level of fine art was a tenet that lay at the heart of the Museum. 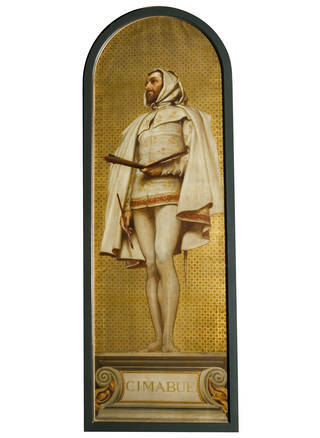 A number of established contemporary artists were approached to produce highly finished oil-painted portraits on which the mosaics could be based. Frederic Leighton, one of the era's most celebrated British artists, was commissioned to paint Cimabue – a Florentine painter and mosaicist, who, together with the younger Duccio and Giotto, was one of the pioneering artists of the early Italian Renaissance. Leighton was a suitable choice not only for his well-regarded output of historical works that depicted the Classical or Renaissance past, but also because the painting that secured his fame, Cimabue's Madonna Carried in Procession through the Streets of Florence was bought by Queen Victoria after it was shown at the Royal Academy in 1855. 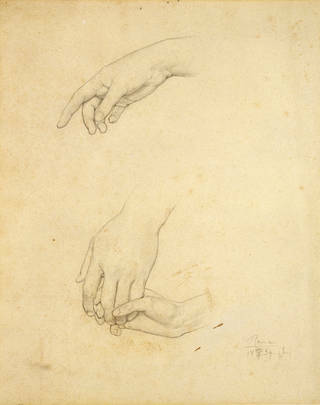 Leighton's delicacy and lightness of touch made him an excellent draughtsman as can be seen in his sketch of three hands he made in preparation for Cimabue's Madonna. His painting of Cimabue for the South Court, is a statuesque homage to the great painter, showing him full height but with his face in three-quarter profile – as if the artist were gazing into the distance, scrutinising his subject – and lightly clutching his paintbrush. Cimabue's cloak and tunic are likely taken from one of the published compilations of historical costume that were popular with historical genre painters. Other panels were either derived from printed sources – in particular the woodcuts that illustrate Vasari's Lives of the Artists – or taken from portraits. The mosaics remained in place in the South Court until 1949, when one side of the Court was converted into a new restaurant. They can now be seen displayed around the Museum, along with some of the painted designs. The V&A is planning a restoration of the South Court, which will allow visitors once again to appreciate the mosaics in their original elaborate architectural setting of richly coloured cast and wrought iron. Still in their original position, however, are the two semi-circular lunettes that once overlooked the South Court, with frescos painted by Leighton. In 1865, Francis Moody, one of the Museum's team of in-house designers, was commissioned to paint a copy of Raphael's School of Athens for execution in mosaic in one of the lunettes, but this was later rejected, as mosaic proved too expensive. In 1868 Leighton was invited to contribute and proposed to paint frescos instead. Leighton completed The Arts of Industry as Applied to War in 1880, and The Arts of Industry as Applied to Peace in 1886. Leighton's choice of fresco as a medium followed Prince Albert's ambition to revive the art of fresco painting in Britain as part of his campaign to raise the standards of public art. 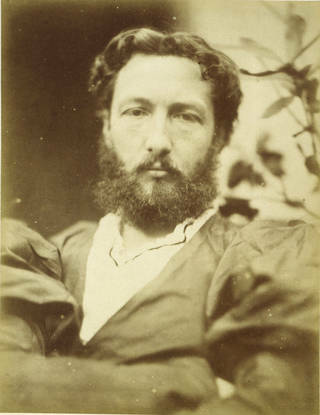 Leighton used a complex process involving a number of stages and years of work. First, he drew a sketch to establish the overall composition. Then he made a highly finished drawing, for approval from the Museum. Once approved, students from what is now the Royal College of Art copied the design in charcoal onto canvas, one half the size of the lunette and one much smaller. On the smaller of the two, Leighton painted an oil sketch to work out the colour scheme. On the half-size canvas, Leighton painted a detailed cartoon for the design in browns and whites, to identify areas of light, shade and volume. The students then enlarged this cartoon onto a huge canvas the same size as the lunette. This was used to transfer the design onto the wall. A full-size cartoon for Peace was made to transfer the design onto the wall by knocking charcoal through holes in the canvas. Afterwards, Leighton could finally begin painting the fresco into the wall. This full-size cartoon was kept by the Museum, but the cartoon for its companion fresco, War, was thought to be lost. However, in 1995, X-ray analysis showed that the cartoon for Peace was actually painted directly over that for War. Areas of the original design can still be seen underneath as light-coloured patches. The two completed frescos measure 4.9 metres (16 feet) tall and 10.9 metres (36 feet) wide. Leighton's first fresco, The Arts of Industry as Applied to War, illustrates a group of 30 life-size noblemen and their servants as they prepare to battle to defend their town. In a romanticized combination of 15th- and 16th-century Italian styles and settings, the arts of industry are represented by early Renaissance armour, swords and banners. The palette of deep reds and blues was inspired by the work of 16th-century Venetian masters such as Paolo Veronese. Unfortunately, the artist's experimental attempt to employ a new 'spirit fresco' technique failed, and the medium began to degrade almost immediately. 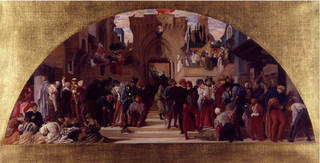 In Leighton's second and corresponding fresco, The Arts of Industry as Applied to Peace of 1886, the setting moves from Renaissance Italy to Classical Greece. Here, the beauty of craftsmanship is celebrated rather than the heroics of war. Its rather incongruous semi-allegorical scene presents labourers unloading decorated vases and carpets from a barge while four languorous Athenian ladies are dressed by servants. The scene includes jewellery, bronzes, goldsmiths' work and theatrical masks. It anticipates the Aesthetic Movement ('art for art's sake') by suggesting that the aim of art may be beauty rather than to provide a narrative or fulfil a didactic purpose. In 1878 Leighton became the President of the Royal Academy and although initially a Classicist in the grand tradition that recalls Georgione and Titian, he later became an influential exponent of the 'subjectless' painting that favoured beauty and atmosphere over allegory and symbolism. His fondness for historical allusion, however, is evident in the compelling advice he gave to future artists in 1893, noting that "nothing will fortify (young artists) better for the future … than the reverent and loving study of the past". 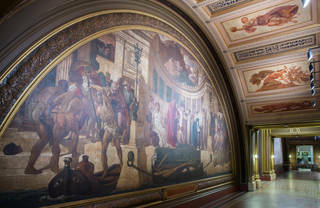 The V&A's Leighton Rooms are a fitting tribute to this master of British painting. Audio descriptions of historic locations in the Museum are available for blind and partially sighted visitors to listen to online at home or during a visit to the V&A. The building of the Victoria and Albert Museum, begun in 1857, is the most elaborately designed and decorated museum in Britain. 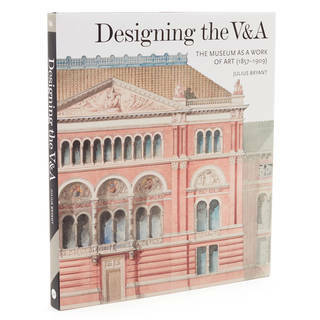 This book is the first to consider the V&A as a work of art in itself, presenting drawings, watercolours and historic photographs relating to the Museum's 19th-century interiors. 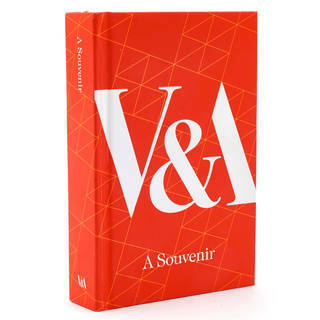 A beautifully designed and informative guide to the collections of the Victoria and Albert Museum, the world’s leading museum of art and design. 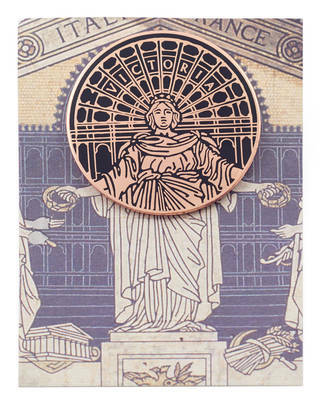 This lapel badge features a celebrated decorative detail of the V&A buildings: the Great Exhibition frieze, from the pediment that tops the centrepiece of the V&A Garden, the ornate 1865 Museum entrance facade.